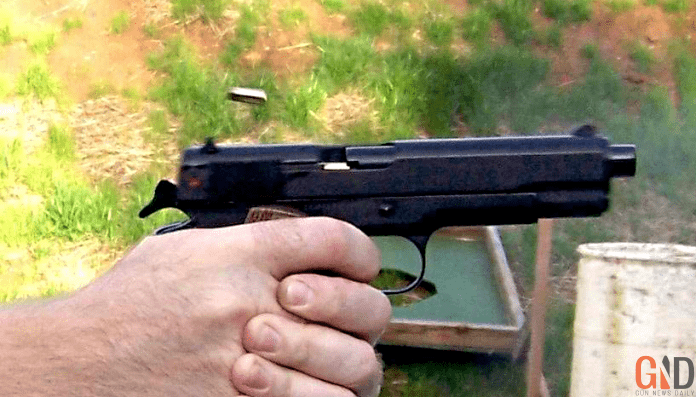 Best .22 Pistols – How to Spot a Top Pick! Twenty-two caliber handguns are perfect for new shooters, providing low noise, less recoil, and better concussion. This popularity with novices also means there are tons of options, making it difficult to decide on the right .22 pistol. Whether you’re just starting out or you’re an experienced shooter wanting to find the best options in today’s market, read on for the best .22 pistols of the year. Why Are .22 Pistols Popular? The .22 is not only easy to use and a pleasure to shoot, but the same caliber is used for rifles and is a popular round. 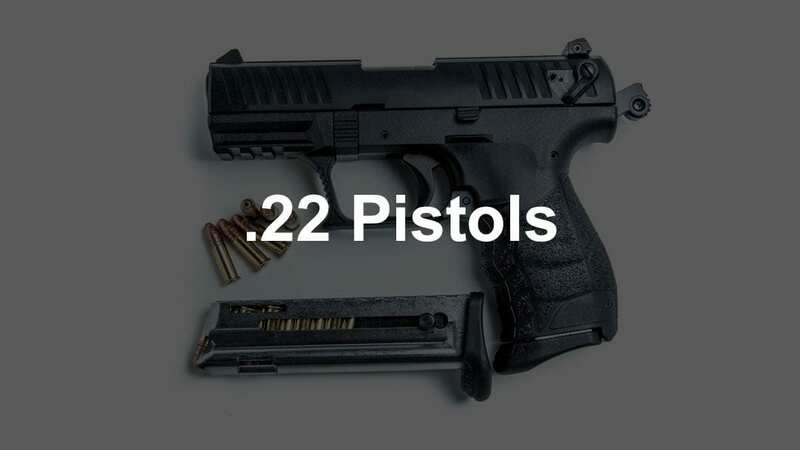 Having a handgun in .22 caliber is thus, an obvious choice for many gun owners, in particular, those with a variety of weapons. These gun owners will enjoy the versatility of a .22 pistol and have proper ammunition available at all times. Additionally, the ammunition is cheap, small, and light. This means carrying ample rounds is considerably easy to do, whether you’re traveling heavy or light. Apart from its ammunition, the .22 pistol is easy to get used to for first-time shooters who are just getting acclimated to proper shooting techniques. The same low recoil that makes it easy to shoot also makes it reliable for casual shooters as a defensive weapon. Needless to say, top-notch performance and accuracy are very important in high-stress situations, and the .22 pistol shines in this area. These same properties make them excellent for smaller shooters, disabled shooters, and many others. Lightweight, relatively small, and easy to conceal, it is excellent to carry anywhere. For this reason, it is a great option, even for those who have little to no interest in gun ownership aside from protecting themselves and their loved ones. While the .22 pistol is an all-around great choice for many people, there are some key factors to look for in determining what makes some of the best options. ​The .22 round is an accurate round at close range, so you should have a gun capable of hitting what you aim it at. While everyone obviously wants great accuracy, this is even more important for novices. Learning to shoot is a lot more fun when you’re successful at it. By seeing early progress with an accurate gun, you’ll quickly get accustomed to other aspects of the discipline. Seasoned pros will also want accuracy, but don’t need the absolute best if other factors are on the line. ​Also important for novice shooters, ergonomics should play a big role in your decision. Many mini-revolvers in this class are not comfortable. Get a pistol with solid ergonomics, and your performance will increase. If you can’t comfortably get a good shot, high accuracy doesn’t matter much, does it? ​A pistol with lots of options is more important than an immediate value. Would you rather purchase a cheap gun with expensive mags? Probably not. Support for customizing your triggers, sights, magazines, and so on gives you room to grow. How Accurate is a .22 Pistol? The .22 pistol is renowned for its short range accuracy, due in large part to the size of the round. In fact, it is so easy to maintain high accuracy with a .22 that the Boy Scouts use it for their rifle shooting merit badge. Additionally, it is a favorite of target practice shooters. It’s generally agreed upon that while the .22 pistol is perfect for close range, it’s less accurate at longer ranges. But when does this accuracy begin to taper off? You might think that with this reputation of inaccurate shooting for anything that isn’t right in front of you, you might expect it makes you feel blind as a bat, but it’s truly not that bad. Believe it or not, it’s accurate up to 150 yards depending on a variety of factors, such as the barrel. Of course, the ammunition used also makes a huge difference. Thankfully, this popular caliber has an extensive range of ammunition choices. While the most popular is LR, many types of ammunition, such as the .22 extra long, can help provide improved accuracy. Now that we have a little bit of background info under our belt, let's take a look at some of our favorite models. 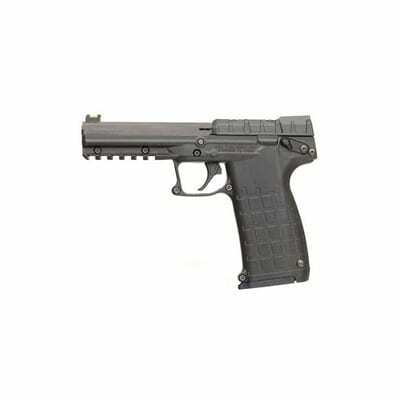 The Ruger SR22 Semi-Auto Rimfire Pistol is one of the most popular .22 pistols on the market, and for a very good reason. Not only is it an all-around solid pistol, but it strikes a perfect balance between ease of everyday carrying and target shooting. Made from high-strength polymer, stainless steel, and aerospace-aluminum, the materials used are top-notch, durable, and relatively lightweight. Ruger supplies two interchangeable grips for wider or slimmer holds, as well as pinky-finger floorplates. A Picatinny rail below the Ruger’s barrel allows for mounting of accessories. This high-quality material construction keeps the Ruger from feeling heavy, while .22LR cartridges minimize recoil on such a light gun. The stock sights are quite nice. The front sights are fixed, while the rear sights may be adjusted for elevation and windage. Featuring an ambidextrous manual safety, so long as the Ruger is in a safe position, the pin will not contact the cartridge. When in fire position, a red area is visible that is blocked when the safety is active. This is a great visual feature. One excellent feature of the Ruger SR22 is how easy it is to disassemble and reassemble. Combine this with the fact that it’s incredibly popular, and you’ll be able to modify it to your heart’s content with exceptional ease. This provides easy access to countless sights, magazines, triggers, or whatever else you’d like to improve. 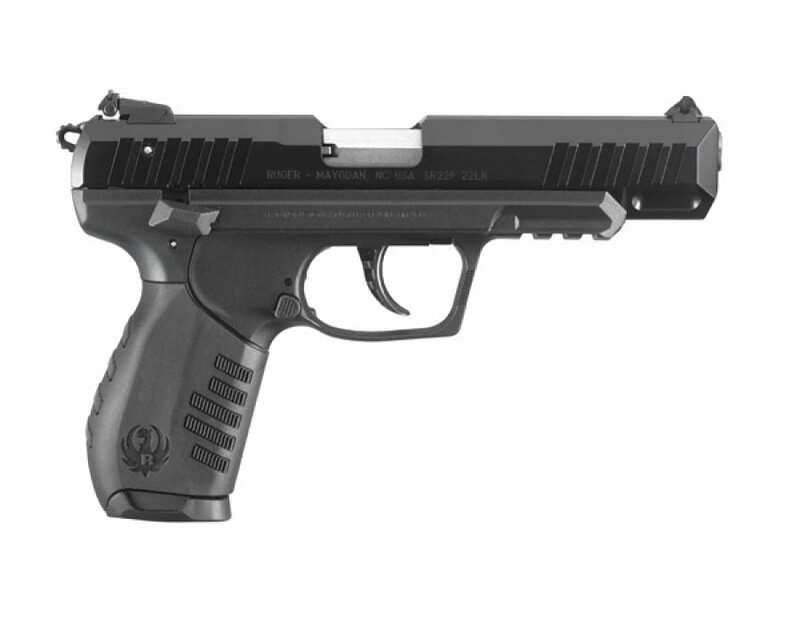 Overall, the Ruger SR22 Semi-Auto Rimfire Pistol is a popular pistol for a reason: it’s relatively affordable, easy to use, lightweight, and very safe. It makes an excellent option for seasoned shooters, particularly on the range, or for novices just starting out who want the most hassle-free introduction to firearms. Incredibly reliable, easy to use, operate, and modify, the Ruger SR22 Semi-Automatic Rimfire Pistol is a dream gun for new gun owners, but seasoned professionals will have a lot of fun using it casually as well. The Browning Buck Mark Standard might be a runner-up on our list, but don’t think it compromises on quality. With an aluminum alloy frame in a gorgeous black finish, this gun is durable and stylish. A stainless-steel barrel keeps the gun well-balanced in the hand. While it markets itself as a right-hand weapon, it operates well for lefties, too, and is fitted with proprietary, textured grip panels. It is one of the nicest and most comfortable .22 pistols to hold, which will definitely improve shooting accuracy, as well as response time. Stock sights are incredibly precise and provide an immediate view. A light, gold-plated trigger operates as smoothly as its appearance. With Buck Mark’s straight blowback and minimal recoil, it operates very well. 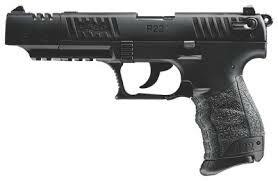 Overall, this gun is slightly nicer to hold and use than the Ruger SR22 and its design makes it very easy on the eyes. This is a solid weapon for beginners and seasoned pros alike. So why is it the runner-up? Well, for starters, it’s nowhere near as easy to disassemble and reassemble. That’s not to say that it’s hard, but Browning didn’t go out of their way to make it easy for beginners. Likewise, since it’s not as popular, it can’t boast the same massive range of compatible upgrades as Ruger can. We don’t consider these to be strong downsides, because it’s still easy to modify your Browning Buck Mark Standard URX Semi-Auto Rimfire Pistol with plenty of available options. Novices could still use the stock configuration just fine. A truly model pistol, the Browning Buck Mark Standard URX Semi-Auto Rimfire Pistol is perfect for novices who want to dip more than a toe in the water, offering less hand-holding than a Ruger SR22 in exchange for a beautiful design and arguably better features. Those with a little more experience shooting may well appreciate the Kel-Tec PMR-30, which comes packed with some very nice features. First off, the unique combination blow-back and locked-breech system allow for markedly excellent performance on a range of various types of ammunition. In short, the handgun will seamlessly adjust to varying degrees of pressure on the cartridge. Not only does it mean that different types of ammo will generally perform better in a Kel-tec, but also that they will perform more similarly, with more of a universal shooting experience. The construction is a premium blend of aircraft aluminum with glass-reinforced nylon, giving it solid durability and a smooth finish. We love the grip, which provides excellent traction from just about every angle. A fluted barrel provides less weight, although it does make it more back-heavy—not a problem for seasoned shooters, though novices may better take to a more weight-balanced pistol. Other features include dual-opposing extractors, a heel magazine release, a dovetailed aluminum front sight, and a Picatinny accessory rail below the barrel. Overall, the Kel-Tec PMR-30 is great for shooters who have some experience under their belt and enjoy using a variety of ammunition with a consistent experience. The Kel-Tec PMR is a great magnum pistol for shooters who love some variety in their ammunition, have at least a bit of experience shooting, and want consistent and solid performance at all times. Offers a Wide Sight Radius. The Walther P22 Target Black Semi-Auto Rimfire Pistol might be exceptional for target shooting, but don’t discount it as an option for everything else, too. With a focus on ergonomic design and an extended sight radius, as well as a super-comfortable, cross-directional grip, it’s exceptionally easy to go from getting a great hold on your pistol to a solid view of your target. Not only that, but the pistol also comes with interchangeable backstraps for a customized hand fit. An ambidextrous magazine release is easily reached from the thumb. Walther also includes some three-dot, low-profile sights, perfect for acquiring a target no matter the lighting available. It also should help in a variety of well-lit conditions, as well as those with older eyes or reduced vision. The rear sight may be adjusted for windage with a simple screw design. Overall, we love this gun for how ergonomic it is. While it’s not the best pistol in other regards—it’s not the best-looking, and its performance can’t match some of the others—it’s by far the most comfortable and easy to use. This makes it perfect for those who specifically want a gun for sport, such as casual target shooters. However, the ergonomic design, wide sight radius, and three-dot, low profile sights would also be perfect for those with disabilities. For sure, the Walther P22 Target Black Semi-Auto Rimfire Pistol won’t appeal to everyone, but we think that casual shooters, sports shooters, those with disabilities, those with poor vision, or those who’ve had a difficult time holding a pistol in the past for whatever reason, will all adore this gun. The most comfortable and easy to hold pistol on our list, with plenty of accommodating features, this pistol is perfect for a range of users including sports shooters, those with poor vision, and the disabled. If you’re looking for the best .22 pistol to discreetly carry concealed, look no further than this instant classic from Smith & Wesson, the M&P22 Compact. With a length of just 6.65 inches, including a 3.56” barrel, this gun really isn’t much bigger than a lot of today’s modern cell phones. At under a pound, it’s almost as light as one, too. This introduces some unique challenges that Smith & Wesson took head-on: for example, a gun this compact needs to have really good recoil and a great grip. Additionally, the target market is clearly going to be those to whom a smaller, lighter gun appeals, namely women, smaller people, and those with disabilities. So, did they deliver? You better believe it. Despite its small size, it performs admirably in field tests. In order to compensate for its small size, Smith & Wesson took the design and production in-house, whereas many of their .22s had previously been outsourced to Walther. This studious effort paid off, with a very comfortable grip that helps push the gun into the hand. Recoil is greatly diminished and hold is secured, with interchangeable backstraps included for a custom fit. Accuracy is also very high, and in fact, it rivals or bests many larger pistols. That said, with such a short barrel, you won’t get the best sight radius, but it’s almost comparable to every other pistol on our list due to smart placement. Of course, its small size means it can easily be concealed. If you can hide your phone, you can hide this gun. And at under a pound, it’s one of the least cumbersome guns conceivable. Whether carried in a holster or slipped into the smallest of handbags, this is a handgun perfect for discreet personal protection. 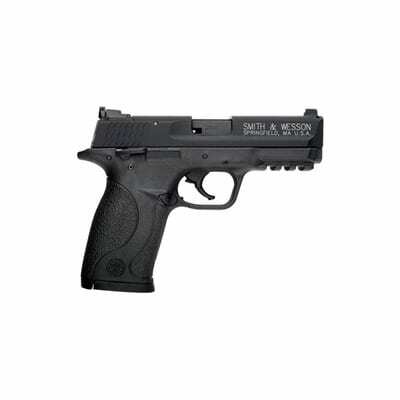 If you’re looking for a concealed carry, look no further than the Smith & Wesson M&P22 Compact 3.56ir Black 10+1rd. At 6.65 inches and less than a pound in weight, it’s perfect for maintaining discretion. 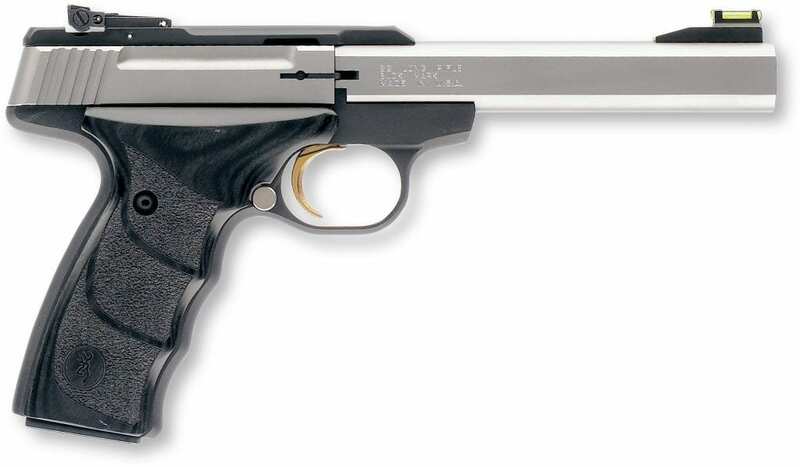 A solid .22 pistol is an excellent choice for novice shooters and seasoned gun owners alike. With minimal recoil, excellent accuracy, and a smaller design that won’t over-encumber anyone, they’re perfect for a range of uses. Whether taking it to the range for sport or practicing discreet concealed carry, the .22 pistol is perfect. There are many options on the market and our guide has uncovered the best for everyone’s needs. Whether you’re looking for a solid, all-around beginner’s pistol like the Ruger SR22 Semi-Auto Rimfire Pistol or you want the most low-profile pistol on the market with the Smith & Wesson M&P22 Compact, we’ve uncovered the best. Have fun, secure yourself, and enjoy the .22 pistol!